Which of China's universities has the largest international impact? Which university is favored the most by world leaders? Which university is visited by the largest number of leaders from other countries? A report released earlier this year by cuaa.net showed that more than 250 leaders of other countries have visited or delivered speeches at almost 60 universities in China. Cuaa.net, also known as the Chinese Alumni Network, often releases rankings of Chinese universities. According to the report, Peking University, which has been visited 21 times by G20 leaders, is deemed to be their "favorite university in China". 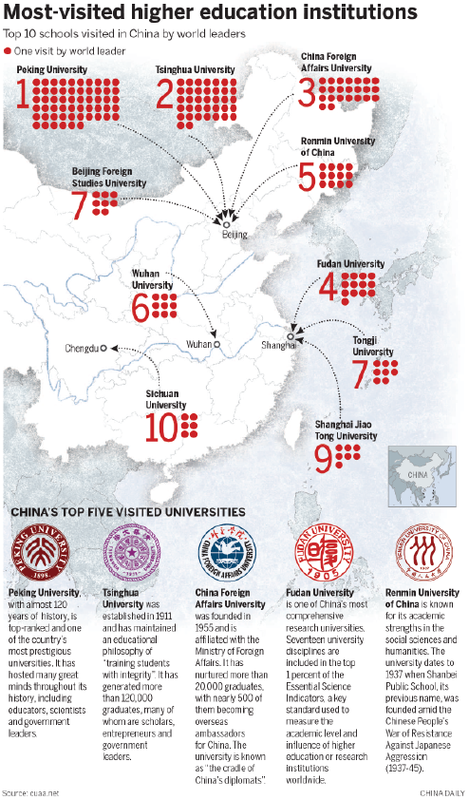 It is followed by Tsinghua University in Beijing, which was visited by leaders 14 times, and Tongji University in Shanghai, which was visited eight times. The report also found that leaders from Germany, having made 16 visits to Chinese universities, are more passionate about touring such higher education institutions than their peers from other countries. Following Germany is France, with leaders from that country visiting Chinese universities a total of nine times. Cai Yanhou, a senior researcher with cuaa.net and a higher education researcher at Central South University in Changsha, Hunan province, said visiting leaders consider factors such as the impact of the university, as well as the university's historic and business links with their country. Further analysis based on the report found that United States presidents prefer to visit Tsinghua University, while Russian presidents and Australian leaders favor Peking University.